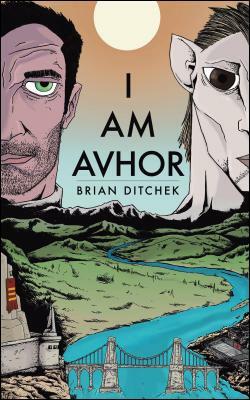 I Am Avhor by Brian Ditchek is a sci-fi/fantasy read. The book cover intrigued me right from the get-go. This is a story of an earth-like planet and the humanoids who live there. As you can see from the cover the occupants of this planet look a bit like horses (they even have tails!) and they think humans look quite strange! The blurb on the back cover says “A fast-paced sci-fi adventure with themes of love of family, heroism and justice.” On the whole I agree with this sentiment, but the fast pace of the story was not as fast as I like. It flowed better towards the end of the story but I didn’t feel the first half had much of a fast pace. I Am Avhor begins with a human space admiral and his loss of a research team on the surface of a nearby planet. Perhaps they were captured? Then it jumps to a swordplay event happening on another planet – Vacaron – where the rest of the story takes place. Here we’re introduced to King Harad and his son who is competing in this swordplay event. Nowhere in this beginning chapter is there a clear description of what a Vacaron looks like. I realize the front cover displays one but I like my descriptions in words. There is a quick mention of the humans and how they differ from Vacarons but it wasn’t clear enough for me. Maybe I’m just picky! As the story rolls along it becomes more cohesive. The people and situations that seem disjointed at first do come together later on. The story is fairly predictable but there are a few conflicts you don’t expect. Once I met a few more of the characters I immediately knew what was likely to happen and how the story would end. And it did. The actual writing is well done. There are a few editorial errors, as I’ve found in almost every copy I’ve received to review. Nothing that makes the story hard to follow or understand, so that’s good. I believe this book is geared toward young adults, even teen readers. It works well there as there’s a good moral base to the story. I Am Avhor is a good stand alone novel. It’s left with closure but also there’s opportunity to follow the story further. If Brian Ditchek were to write another book in this line I would be very interested to read it.